When learning how to apply joint compound, less is usually more. Taking a little extra time to add thin, even layers, allow each layer to dry completely, and sand carefully will help insure invisible seams and clean corners. 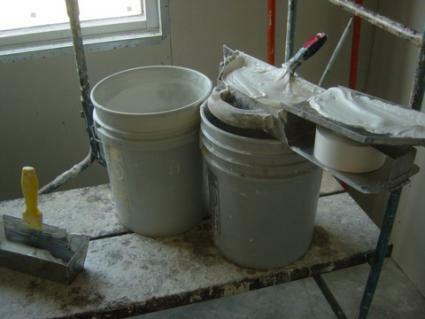 Joint compound, or drywall compound, is available in two basic varieties, one that dries quickly and one that cures slowly but is easier to use. They each have advantages and disadvantages. All Purpose - Works in any drywall application from taping to finishing. Taping - Especially formulated for excellent bonding ability, this blend is designed for use as a first coat or filler. Topping - Formulated as a top or final coat, topping is very silky and feathers well. It's easy to sand and creates a superior, smooth finish. Setting-type Joint Compound - Unlike drying-type varieties, this mixture sets via a chemical reaction. The advantage of using this vinyl-based preparation is that it hardens super-fast. It's rated for drying times as short as 20 minutes, depending on the manufacturer. It also resists cracking and shrinking. One of the disadvantages is that it dries so hard it can be difficult to sand. It isn't available premixed, either. Water starts the clock on the chemical drying process. For the user, this means guesstimating how much you'll need pretty accurately because you'll have to pitch anything you don't use. Whichever variety you choose, you'll probably need to apply about three coats. The table below will help you determine how much joint compound you'll need. Type Preparation Qty. Sq. Ft.
Drying-type Mix 6 gal. 700 sq. ft.
Drying-type Pre-mixed 50 lb. bag " "
Setting-type Powder 2 bags " "
Use three layers, one to cover the tape with an overlap of about three inches on either side, one to establish the seam and a last finishing coat. As you proceed from layer to layer, be sure to widen the seam by about six inches each time. It will help you get a smoother coat if you use a wider drywall knife for each application and finish with an eight to ten inch knife. If you aren't using setting-type joint compound, make sure to let your work dry thoroughly between applications. Read the directions on the product you're using for guidance on how long you should wait between layers. Always sand your work with 120-grit sandpaper between layers and clean the dust away completely before continuing. After the final layer has dried, use 200-grit sandpaper or better to smooth it out. On the second and third coats, feather your edges to help cut down on the sanding you'll have to do later. Applying a topping mixture as a final layer will help you create a smooth, invisible seam. Outside Corners - When finishing outside corners, use a metal corner bead and secure it in place by drilling drywall screws into the studs at five inch intervals. Apply three layers of joint compound starting at the nose of the bead (where the two walls join) and working out on either side using the process outlined above. Inside Corners - When working with inside corners, use adhesive backed tape folded in the center and pressed firmly into place on the drywall. Work from the inside of the corner out. Apply three layers here too. Becoming an expert on how to apply joint compound may take a little practice, but a light touch, and the right tools and materials will take the frustration out of the process and help you create professional looking seams.